ABBADIE DE SAINT-CASTIN, BERNARD-ANSELME D’, Baron de Saint-Castin, French officer, commander in Acadia; b. 1689 at Pentagouet, son of Jean-Vincent d’Abbadie de Saint-Castin and Pidianske (Marie-Mathilde), an Indian woman; d. 1720 in Béarn. After Jean-Vincent de Saint-Castin’s departure for France in 1701, western Acadia was in a precarious state. It was above all important to regain control over the Abenakis. As the situation was getting worse daily, Governor Brouillan [Monbeton], seeing that the baron was not returning, decided in 1704 to appeal to his son Bernard-Anselme. This young man, a pupil at the Petit Séminaire of Quebec, was still only 15. But Brouillan thought that, being born and brought up in his mother’s tribe, and rigorously trained by his father, he would have the necessary standing and competence. He was not wrong. Bernard-Anselme rallied his tribe, and immediately proved himself equal to the task. The war of harassment against the settlers in New England flared up again more violently than ever. Young Saint-Castin showed the extent of his bravery in the defence of Port-Royal (Annapolis Royal, N.S.) first from 8 to 16 June (n.s. ), then from 20 to 31 Aug. 1707 [see March]. In the course of several bitter fights, he played a leading role at the head of his Abenakis and of the settlers, so much so that the new governor, Daniel d’auger de Subercase, in a letter dated 22 September addressed to the minister, had no hesitation in recommending him for the rank of ensign. Meanwhile the news of Jean-Vincent’s death had arrived. Reduced to inactivity as a result of several wounds received in the battle of 31 August, the fourth Baron de Saint-Castin took advantage of the occasion to get married. On 31 Oct. 1707, in the Port-Royal that he had so stoutly defended, he married Marie-Charlotte Damours de Chauffours, daughter of Louis Damours, seigneur of Jemseg, one of Jean-Vincent’s comrades in arms at the capture of Pemaquid (1696). In December the baron’s sisters married Philippe Mius d’Entremont and Alexandre Le Borgne de Belle-Isle respectively; thus the Saint-Castins, Franco-Abenaki half-breeds, became linked by marriage with the best Acadian families. On 20 December, in a further letter to the minister, Subercase recommended Bernard-Anselme for the rank of lieutenant, with command of the Indians in Acadia. The court granted him this latest responsibility on 6 June 1708. Bernard-Anselme began by dividing his time between Port-Royal, where he had his family residence, and Pentagouet, his native village, which remained an advanced bastion of the Acadian defences. But he was not really an Abenaki chief in the absolute sense, as his father had been, and he devoted little of his effort to trading; he continued to be a French officer, entrusted with command of the Indians, as he had been appointed by the king. For living expenses, he was content with his pay. But the following year he adopted a quite different type of activity. He fitted out a ship and became a privateer. He joined forces with other famous privateers, Pierre Morpain*, Pierre Maisonnat, ditBaptiste, and Daniel Robinau, who gave a lot of trouble to the English; in the year 1709 alone they sank 35 of their ships and took 470 of them prisoner. However, Port-Royal was doomed, for New England had vowed to avenge the humiliating defeat of 1707. While the unfortunate Subercase was vainly asking Versailles for help, Queen Anne was giving substantial assistance to the colonies of Massachusetts, Connecticut, New Hampshire, and Rhode Island, to enable them to organize a formidable expedition. On 5 Oct. 1710 the governor of Virginia, Sir Francis Nicholson, at the head of 2,000 soldiers borne on 36 ships, laid siege to Port-Royal. Subercase had only 158 regular soldiers and 127 militiamen to put up against him; he resisted the invader for a week, and finally capitulated on 13 October. A week later Saint-Castin, who knew nothing of what had happened, appeared before Port-Royal, which had already been rebaptized Annapolis Royal. His ship was captured, but he managed to escape and take to the woods. The English hastened to make him enticing offers if he would agree to come over to them; nothing could better show the extent to which the son had inherited the prestige and power of the father. Naturally, he declined these offers; he only consented to set out for Quebec with the act of capitulation, letters from Subercase, and an English major, Livingston, who wanted to see the Marquis Rigaud de Vaudreuil. 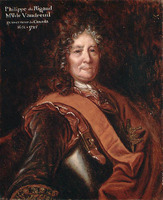 Appointed by Vaudreuil to the command of the whole of Acadia, the baron stayed only a month at Quebec. He left it on 18 Jan. 1711, armed with precise instructions: to keep the Indians hostile towards New England, and to maintain the Acadians in their loyalty to the French crown. Saint-Castin settled at Pentagouet, and for two years carried on his double mission as best he could. In 1711 Saint-Castin’s Abenakis harassed the English garrison at Annapolis Royal. The following year Saint-Castin was appointed lieutenant. On 16 April 1713, however, the treaty of Utrecht, which handed Acadia over to England, was signed. As France kept Cape Breton Island (or Île Royale), efforts were made to encourage the Acadians and Abenakis to go there. Saint-Castin spent the winter of 1713–14 with his tribe, at the falls on the Penobscot River. The Indians did not want to give up their country, and in the spring the baron withdrew alone to the Saint John River. He reflected then that the time had finally come to go to France to straighten out his affairs. He had already been giving thought to this matter, and from 1707 on he had toyed with the idea of setting out. Subercase, who needed him too much, had been opposed to his going, and had asked the minister to intervene to terminate the disputes which were depriving the baron of his family estate. Saint-Castin had thereupon been content with sending a power of attorney to Subercase’s brother-in-law, Jacques de Sarraute-Marjolet. Saint-Castin and his wife left Acadia on one of the last boats to sail in 1714, and arrived in Béarn at the end of the year. Alas! Bernard-Anselme, in the negotiations concerning his estate, was not to be much luckier than his father. If, as it appears, Sarraute won his case against Jean de Labaig, Jean-Vincent’s opponent, he refused in his turn to furnish a full accounting to Bernard-Anselme! Threatened with a lawsuit by Saint-Castin, he invoked the question of domicile, and returned to the charges of illegitimate birth. The court, which was very anxious to send the young baron back to Canada, took up the affair again with the intendant in Pau. It none the less dragged on, and was complicated by a lawsuit with the Chevalier de Florence over another part of the estate. In 1717 Bernard-Anselme was admitted into the States of Béarn, in the order of the nobility. In the spring of 1720 he drafted a memoir intended for the minister on the “Services rendus par les sieurs de Saint-Castin, père et fils, dans le pays de Canada en la Nouvelle-France.” He died the same year, at the beginning of autumn. By his marriage with Marie-Charlotte Damours de Chauffours he had only three children, all daughters: Marie-Anselme, born in 1711 at Quebec; Brigitte, who was a pupil of the Ursulines of Quebec; and Louise, born in 1716 at Pau. Bernard-Anselme’s widow lived at Pau until 1734 and died there, after sustaining a lawsuit before the parlement of Navarre. AN, Col., B, 29–30, 32, 34–37; C11D, 6–8 Charlevoix, History (Shea), V. Coll de manuscrits relatifs à la N.-F., II, III “Correspondance de Vaudreuil,” APQ Rapport, 1938–39, 1946–47, 1947–48 “Lettres et mémoires de F.-M.-F. Ruette d’Auteuil,” 46 NYCD (O’Callaghan and Fernow), IX. Georges Cerbelaud Salagnac, “ABBADIE DE SAINT-CASTIN, BERNARD-ANSELME D’, Baron de Saint-Castin,” in Dictionary of Canadian Biography, vol. 2, University of Toronto/Université Laval, 2003–, accessed April 26, 2019, http://www.biographi.ca/en/bio/abbadie_de_saint_castin_bernard_anselme_d_2E.html.